The 2 left panels of Slipstream Adventure. The 2 right panels. As soon as I get the REAL photography done I'll compose a single image that lines them all up. Right now I can't do that. This is the 4 panels hanging in my gallery at the front of the studio. As you can see I "wrapped" the third panel around the corner. 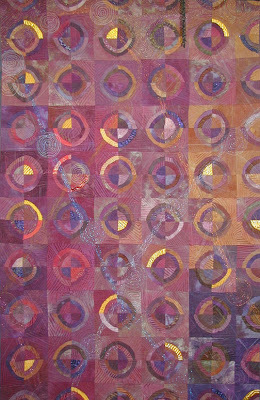 This is a detail shot showing the quilting as well as the foiling done with fusible thread. I am so glad I did this huge project. As I was diving into it I was reminded of the whole house remodel I did in Florida several years ago. Each day it is just a matter of seeing where I was in the full scheme of the project. This project was started 6 months ago. I took off about 5 weeks overall. It's final size is 76" x 154" or about 6 1/2 ft x almost 13 ft. There is a certain relationship one develops with a project of this magnitude. Understanding its parts and being able to break it down into those pieces is what makes it confrontable. Getting the sequence right is a bit trickier and involves being able to think several steps ahead of where you are. For instance-- I couldn't do the fusble thread/ foiling until I had already done the side binding because I wouldn't be able to press the whole piece once the foil was on it-- it would have melted back off and left a mess. Also-- thinking ahead far enough to tear off the side strips that became the facing before assembling the layers enabled me to have facings that matched the backs. This is something one learns from DOING.. as opposed to simply planning or thinking about it. This project's inspiration came primarily from a vision I had of a coloration. On August 16th, 2007 I posted an image of a drawing I did with colored pencils. It was my initial vision of where this project was going. This isn't the first time I was inspired simply by wanting to see what happens when I put certain colors together. I'm not aware of other artists having this as an inspiration point. Perhaps it happens all the time. Maybe I'm just weird. I'm okay with that. As I write this I am awaiting an offer from a prospective employer. I'm thinking my next piece will be along a theme of "When push comes to shove." -- which pretty much covers where things have been at. So I am thinking along the lines of the juxtapositioning of the desire to create art, the need to have an income and the irony that I've worked harder in the last 6 years than I have in my life and that none of those years count at all toward the needed credited quarters of "employment" that allows me to have earned the opportunity at 65 of using Medicare. I don't know about you-- I knew you had to earn social security. But I didn't know you had to earn Medicare. I thought you just paid for it every month. Seems like there is the potential for a social issue there. I never heard of someone not qualifying for Medicare--unless they were a foreign illegal or something. Thanks for going the distance with me. I WILL have quality photos posted here as soon as I get them. I will include the backs as well. I love reading your comments and appreciate them immensely. 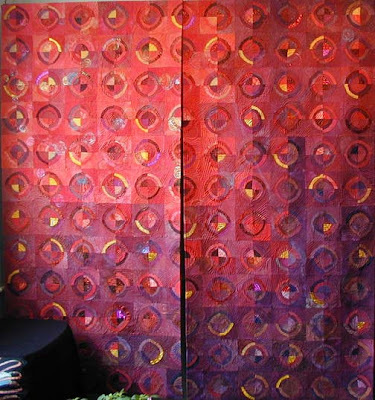 Here is a photo of most of the third panel quilted. I have finished all the quilting on all four pieces--sigh. Make that YIPPEE!!!!!!!!! This is a detail shot of panel number 2. 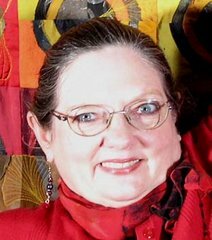 You can still see my chalk lines for dividing and conquering the overall quilting. 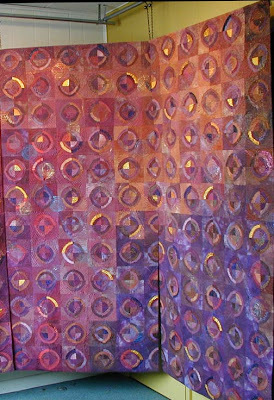 The circles with the winding threads goes through all four panels in five different colors. In each panel the sizes shift--getting larger and spiraling all the way. Again you can see the winding circles plus still the chalk. It'll go away when I get all the steaming done. In order to get all four panels to be exactly the same size I am steaming, trimming and doing the vertical binding on all. Then I'll come back and do the horizontal binding-- more like facing actually. 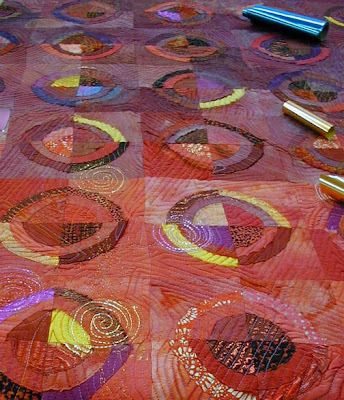 Also-- I am going to do a little trick using the Charlotte's Fusible Web to add foil to each of the spiral circles. It is a neat little product from Superior threads my friend Marlene told me about. It is a thread form of fusible web. I'll stitch it in the sprials using it as a bobbin thread-- but it can't be done until all the steaming, ironing etc is done. Essentially this means I'll be finishing the whole thing and then coming back, stitching with the fusible web and then laying in the foil. It'll be a fairly subtle touch- I hope. One of the aspects that most intrigues me is the journey of discovery as a project of this magnitude evolves. You may remember my initial colored pencil drawing-- go back a few months to see it. In August I started dyeing fabrics and began the assembly. I had NO idea then about anything other than the overall color flow. As it began to be assembled the story line about the "Slip Stream Adventure" came into play while listening to a Van Morrison CD. From that began a dialog with myself about how to create the imagery of a slip stream. So the back got the imagery and then I had to translate that to the front in the form of quilting. To do that I first basted each piece completely so that I was stitching from the back. 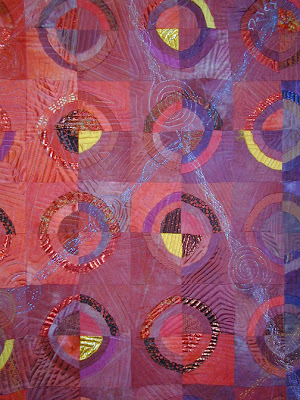 I stitched around each of the painted circles and outlines of the slipstreams using monofilament thread. This created landmarks that I could see from the front. Then I completely re-basted making the front my stitching platform. The next step was to divide and conquer the overall quilting. I used an echo pattern but divided the surface into rough triangles of about 6". Then I stitched from the outer edge to the center of each and moved to the next. The circles and pathways between them were marked in chalk. 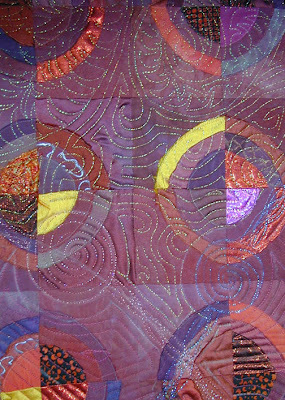 After the overall quilting was done then I went back and did the circles, pathways and slipstream. So all that is left is the facings and the foil. Hold your breath! It'll happen! So --hope that holds you for a few more days until I figure out the photography thing. Overall I am very pleased with this project. I started dyeing the fabrics in August. I took over 5 weeks off completely between trips to Canada and Florida and one miserable week sick. You might wonder why I took on a projectof this scale. Besides being an eternal optimist... I have wanted do to large scale commissioned work for a long while now. The last large scale work I had done was in 2003. I was applying for a large scale project and wanted to make sure that if I got that job that I knew what I was in for. Since 2003 I have learned much and was able to apply it. Also-- doing this project with its grand scale had all sorts of logistical details that I wanted worked out before tackling an even larger project. Next week I'll finally hear whether my work is being considered for the Emerson Electric Auditorium Lobby. Fingers are mucho crossed. Their budget is extensive and it could make a major difference in how my next few months go artwise. Thanks for taking the ride with me. It has been fun.